Join the Bucks County Audubon Society and PennEnvironment for an afternoon of inspiration! 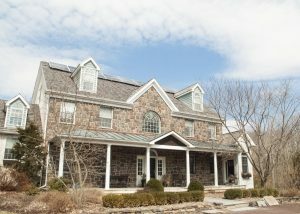 Tour homes and businesses of Bucks County that have shown their dedication to the environment and have made the switch to Solar. Some of the terms and phrases may be new to you, so stay tuned for a brief glossary of some Solar terms. We are working on creating a quality list of helpful terms, so check back! During the tour, Solar Industry Experts at each site will be available for you to pick their brains and talk to about the panels installed at that site and to ask questions about solar on your own property! Please feel free to discuss and ask questions. Interested in sponsoring this year’s tour? Let us know using the form below! The oldest solar installation on our tour, Peace Valley’s solar system dates from 2006. Hoping to live up to their mission to inspire and educate the public about the need for greater sustainability, Peace Valley was an early-adopter and pioneer of this green technology in our area. Their system can be seen along the south side and their meters can be found inside of the Nature Center, known as the Solar Building. In total, the system generates 5,201 kWh a year. Given that solar prices have been dropping every year, it should be no surprise that this installation is the most expensive on our tour, costing $197,000, or roughly five times the average cost of the systems on our tour. On a related note, as solar prices drop, the market has become increasingly difficult for solar installers; Heat Shed, the company that installed Peace Valley’s system, closed its doors in 2014. Nevertheless, Peace Valley’s panels continue to generate electricity for the future. While many solar owners choose to connect their systems to the grid in order to sell their SRECs, grid-connected systems are not without a certain disadvantage: they typically shut down during power outages. However, there are ways around this shortcoming. Even though it’s grid-tied, Barry Oppenheim and Nancy Santanello’s solar system is designed to have off-grid capability, allowing them to use their panels as a backup generator. During 2012, the same year their system was installed, Hurricane Sandy knocked out power in their area for a full week but between their new system and their 40kWh backup battery Barry and Nancy didn’t once lose energy. Their solar panels were installed by KC Green Energy, a Lancaster-area company that was in the roofing business for thirty years before adding solar to their services a decade ago. This was important to Barry and Nancy, who wanted a service that could properly flash and seal their steep, cedar roof. Manufactured by Solar World with an SMA inverter, their system produces about half of the energy they need to power their home and two electric cars. Their solar meters can be found (and visited by tour visitors) both outside and in the basement. Proving their green credentials, their two electric vehicles are successors to a personally-built electric car they drove for seven years prior to buying commercial models. Jim Morano has been interested in energy efficiency since the 1970s, when the oil embargo brought the issues of conservation and American dependence on foreign oil to his attention. He and his wife, Cathy, have long cared about solar energy and environmental issues, having served on the Board at Peace Valley when the park decided to install a solar system and buying their first Prius in 2004 (they now have a second Prius and a hybrid Toyota Avalon). Their growing awareness of the climate crisis inspired them to finally invest in a solar system for their home in 2010. After considering different renewable options and requesting bids from three companies, the Morano’s settled on Heat Shed, the same company that installed Peace Valley’s system. Their roof does not have a face that’s suitable for solar, but they had space on their property for a ground-mounted array. The 10.176 kw system and two inverters were manufactured by Sunpower, and the meter (open to tour attendees) can be found in the basement. Generating an average of 13877 kWh a year, it should take over 15 years payback the $63,000 cost. As with some of the other hosts on our tour, they would have reached payback sooner if the price of SRECs hadn’t fallen, and the Morano’s are firm supporters of efforts to make solar energy more affordable and promote renewables at the state (such as 2017’s Act 40, which should increase the value of SRECs in the commonwealth) and federal level. They also urge those who are interested in installing a solar system on their own property to do so soon, before the 30% federal tax credit expires- it’s scheduled to drop to 26% for systems placed in 2020 and 10% for those built in 2022 or later. However, they also caution against too quickly accepting an offer from a company promising a free solar system- the fine print in the contract might lock you into an escalating electric rate for years. and their system is complemented by both storage batteries and hot water panels. Their south-facing, rooftop system is protected by a mesh “critter guard,” which was added to the system after an intrepid squirrel found its way beneath the panels and chewed through a wire. Hal and Gail encourage all those looking for a way to cut back on their energy costs to go solar. 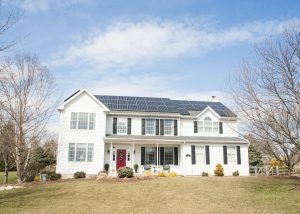 However, they also believe that Pennsylvania needs to raise the prices it offers to consumers for SRECs in order to truly encourage the growth of residential solar in the state, and they encourage everyone concerned to reach out to their state representatives and ask them to fight for higher prices on SRECs in this state. Although Phillip and Christine Flynn have only had a solar system at their current residence since November 2018, they’re not new to the world of solar energy. 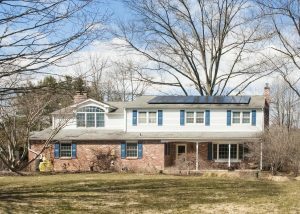 They chose to install a solar system at their Doylestown home based on their experience with one at a previous residence, which managed to net their electric bills down to $0 annually. Their new system is on the front, south side of their home, and they’re proud that it faces the street: they call the panels their “badge of honor,” showing that they’re doing their part for the environment. Their forty-four panel system is estimated to produce about 15,000 kWh a year, and it will likely take six or seven years to payback the out-of-pocket, after-credit cost. They decided to hire Exact Solar to install their system’s Jinko panels and Solar Edge inverter after considering various company’s potential for longevity: they wanted to settle on a company that would likely be around to help with maintenance for the lifetime of their solar system. Their solar meter, open to tour attendees, are in their basement. They’ve also upgraded their HVAC system to a more efficient model in their quest to reduce their carbon footprint. The Flynns recommend that anyone who wants to save on energy costs consider solar and installing a geothermal HVAC system; the latter, which uses the earth’s internal temperature to regulate the climate of a building, is something they had at their previous home and miss. James Baldassarre’s 3.9kw solar installation is, as he says, a trouble-free, small system. He was an early-adopter of the technology and glad to do his part to fight climate change, and he hopes that he can set an example for the rest of the community and inspire them to minimize their own impacts on the environment. Since this is an older system, and given the large trees which overhang the house, he gets only about 30% of his electricity from the system. He gets about 1 SREC every 3 months. 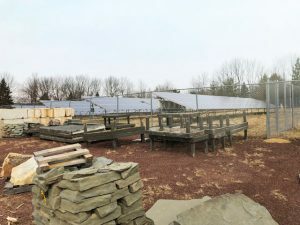 Additionally, he relies on a commercial renewable energy provider (Cleanchoiceenergy.com) he selected through the PECO energy marketplace for the rest of his electricity, further driving down his carbon footprint. Installed by Standard Energy Solutions, a DC-area company, in December 2010, James intends upgrade his Santech panels and SMA America inverter to a newer, more efficient system at some point in the future. James found that with the tax incentives, the cost of his system was more than halved, from $29,000 to $13,500, after the state and federal credits were factored in. He encourages those curious about ways to save money while helping the planet to look into similar tax incentives for other kinds of energy efficiency, like upgrading your windows or insulation, and to consider the many low-cost ways of going solar, such as leasing a system. A firm believer in the need to shift our society to 100% renewable energy, James asks that we encourage our state representatives to adopt a state-wide plan to eliminate fossil fuels. A solar system seemed like a good investment to Tom of Bucks Country Gardens. It would cut the electric bill for his business by 75% and, because of the SREC market, he thought that the cost of the system and installation could be paid back relatively quickly. It would also be another green feature for Bucks Country Gardens, which also has an environmentally friendly drip irrigation system in its nursery. He accordingly decided to install a solar system at his business in 2010. 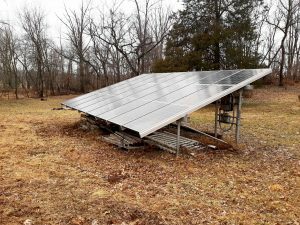 He chose Moore Energy as his installer due to a referral, and found a close, but out of the way location for his system at the northeast corner of his property. The 137.54kw system, which generates 160,000 kw a year, was manufactured by Mage Solar and features a Satcon inverter; the solar meter, which is open to tour participants, can be found at the inverter. However, SREC values have plummeted and Tom’s savings dwindled with them, and his system is now taking ten years, which is longer than he had expected, to reach payback. Due to this financial situation, he doubts he would have installed in his system when he did if he realized how long it would take to see a return on his investment. For that reason, Tom suggests that anyone considering solar should do their homework and guarantee that you’ll see cost savings before committing to a system, and he believes that correcting the SREC market would be an important next step for the future of solar energy. Installing a solar system was a long-term goal for Curt and Candy Sawyer. Looking to reduce their carbon footprint, they bought their current Doylestown house in part for its south-facing, unshaded roof. 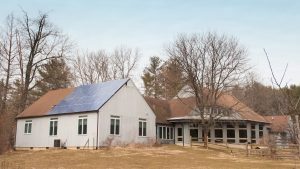 In order to facilitate the installation of their system, they installed a standing seam metal roof where they intended to place their solar panels. This allows for their solar panels to be attached with clips and eliminates the need for roof penetrations. Their system, manufactured by Jinko and installed by Exact Solar in September 2018, is now in its first year of use and is designed to provide all the energy needed by their home and electric car for the average year. Current projections based on the first several months of meter readings suggest that the system will generate 18.4 mWh a year. The system, which cost $37,352, should pay for itself in nine years. Their solar inverter, manufactured by SolarEdge, conveniently monitors their generation and system and connects to the internet to easily sell SRECs. 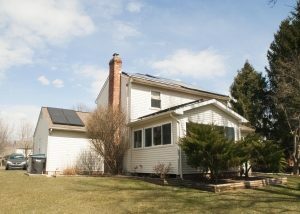 The Sawyers encourage anyone looking to save energy or cut back on their carbon footprint to consider switching to solar, pointing out that solar panels are low-maintenance, easy to use, and have never been cheaper, and to consider doing so before the federal solar tax credit begins to decrease in value in 2020. They believe that the public would benefit from decentralized electric generation and making household solar easier to access. While William and Dayane Bock have never opened their home for a solar tour before, they’re no stranger to solar tours- they’ve participated in 3 as attendees. Given that, it’s safe to say they’re excited and passionate about solar energy. Believing that “solar panels make financial and environmental sense” and looking to save money, the Bocks chose to have Moore Energy install their system after a tour of Moore’s local Southampton facilities and feeling impressed by their products, service, and potential for longevity. Their array is located in an open space in their yard, a location selected for its distance from both shade trees and potential construction or landscape work near the house; additionally, this allows them to use the space beneath their panels as a shed. Their solar meters, open to tour attendees, are similarly stand-alone. 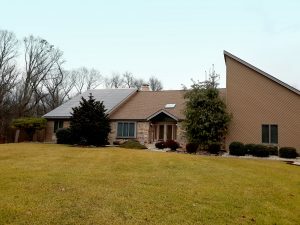 The Bocks’s 7.44 kw system produces 6,831 kWh a year; at that rate, it should take 12-17 years to pay back the $16,000 it cost upon installation in December 2017. The system was manufactured by Winacio and they use a Fronius Primo inverter. While they have never had a technical problem with their system, they have found that leaves and other falling detritus occasionally land on their panels, and they caution that trying to clear snow off the array on sunny winter days can lead to a pulled muscle. They’ve also found that birds nest beneath the panels, but the birds haven’t yet interfered with the wiring. Additionally, the Bocks burn firewood for heat during the winter and have a high-efficiency Jotul F600 woodstove and a 93% efficient Mantis condensing gas fireplace, and plan to incorporate a gasification wood boiler and solar hot water vacuum tubes to supply hot water for radiant heat. They recommend that anyone who wants to upgrade to solar take their time and get quotes from several solar companies, comparing the different vendors’s experience and warranties. If you’re considering a free or leased system, they encourage you to pay close attention to the fine print. 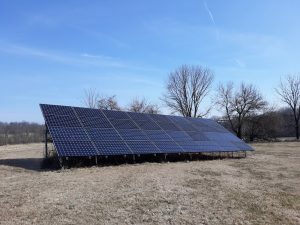 Lastly, they suggest considering optimizing the placement of your panels for generation during the fall, winter, and spring, rather than the customary spring through autumn, which Will says he would consider doing differently if he were installing his solar system today.